Should I Pay Cash for My Next Car or Finance It? Most people don’t have any choice except to finance their cars. However, if you are reading this column, the chances are you are in that fortunate higher demographic income group, and can afford to pay cash for your next car. People who read newspaper columns and blogs tend to be more intelligent and affluent. But, just because you can, is it the right move? Many people think they can get a better deal on a car if they pay cash. This was true 50 years ago before dealers discovered the new profit center referred to as the Finance and Insurance Department. Today this is not true. In fact, paying cash may even make the actual vehicle cost you more! The reason for this is that car dealers make money when they handle the financing with the bank or with the manufacturer’s lenders like Ally, Honda Finance, or Chrysler Credit. A dealer typically averages about $4,000 on every car he handles the financing on. Therefore, if the dealer’s minimum acceptable profit on the car’s markup was $1,000, he may sell it to someone who he could make $4,000 finance profit on for less than someone who he knew was a cash buyer. Dealers will sometimes sell a car for zero profit or even lose money on the car because they can make a good profit on the financing. If you plan on paying cash for your next car, my recommendation is DO NOT TELL THE CAR DEALER THIS. Tell the car dealer that that you are considering financing with him. This will help you get a lower price because the dealer still has hope that he can make money when he finances our car. The average profit a car dealer makes financing cars is much larger than he makes marking up the selling price. My second recommendation is check interest rates and terms with your own bank or credit union before you talk to the car dealer’s finance people. The finance manager (aka business manager) is on commission and paid a generous percentage of the profit he makes by marking up the bank’s interest rates and selling you extra “products” like extended warranties, GAP insurance, and car maintenance. One argument in favor of financing a car is being able to keep your money invested, and earning a greater return than your interest cost of financing. There has never been a never time in our history that this is true. The bad news is that interest rates are not only at historical lows for borrowing but also for CD’s and interest income. With very good credit, you can finance a new car today for between 2% and 3%, but you can’t find a short federally insured CD for that amount. However, you can find very secure equity and bond investments that will earn considerably more than your cost of interest on financing a car. I continuously get phone calls, emails, and texts from car buyers who mostly have “already bought a car”. The “horse is already out of the barn” and they want me to give them advice on how to get it back. Most of these car buyers went car shopping and bought their car alone. Most of the complaints are associated with verbal promises by the sales person, not committed to writing. 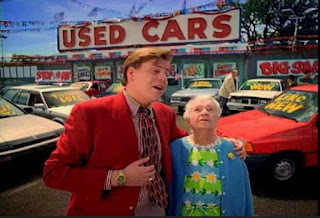 Bringing at least one other person when you are car shopping doesn’t negate the importance of getting all promises in writing, but substantially lowers the chances of a car salesman trying to pull a fast one. The salesman and his manager know that, in court, two people’s word trumps one. A woman wrote me a letter this week in response to one of my columns. Her husband had recently passed away and this was the first car she had bought on her own. The dealer did not have the model car with the accessories she wanted and was unable to locate one at another dealership. She did not want to decide without seeing the actual car she wanted to buy but the salesman and manger talked her into signing a buyer’s order, assuring her that she was under no obligation to buy. They also included two accessories that she did not want because “the manufacturer required it”. I’ve heard of distributors ordering cars with certain accessories from the manufacturer which essentially makes them “standard”, but never “$250 floor mats” which was one of the accessories she mentioned. I get a lot of emails, phone calls, and letters from people who made a bad deal in their car purchase and want to know how they can get out of it. This is one of the less egregious, but I chose it because it was a simpler and shorter example. There is strength in numbers when shopping and negotiating to buy a car. In fact, this applies to any serious decision in life. You might be the sharpest, shrewdest negotiator on the block, but your odds of striking a better deal and not get taken advantage of are enhanced when you have others on your side. Personally, I make a habit of always having at least one partner when I am engaged in a serious, adversarial decision-making process. When meeting with those on the other side, I make it a point to arrive with at least as many people as they have present. One reason is the psychological factor. When you are in an office by yourself with 2 or 3 others, it can be intimidating. Another reason is that you always have people on your side to corroborate what was said. If a salesman or a sales manager makes a verbal promise that can be corroborated by a friend or two, it is far less likely to be broken. It will also hold up in court, if it must come to that. Of course, the better solution is to see that all promises are committed to writing. Buying a car, especially a new car is often an emotional decision. Having a friend or two with you can help you make more of an analytical, logical decision. Another point of view is always useful when making an important decision. Also, having one or two friends with you slows down the process to a level more easily absorbed and understood by you. A friend will often think of a question you should have asked but forgot.